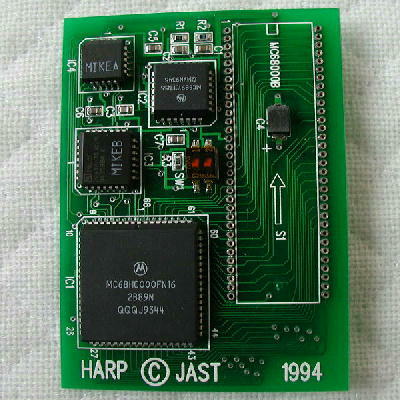 H.A.R.P for mc68000 was manufactured and sold by Jast Inc from 1994 and is accelerator board for X68000. This is a replacement board for the X68000 Built-in CPU and it is intended to be plugged into the CPU socket to increase processing speed. 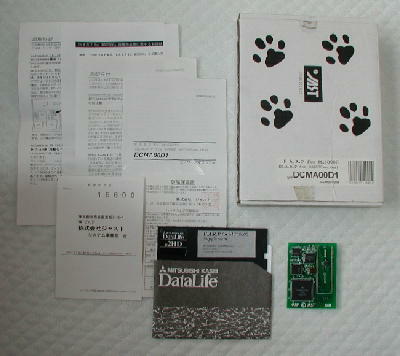 It is compatible with first generation models (except those that have soldered in CPUs) up to SUPER. There is a red dipswitch in the center of the photo labeled SW1. Both switches must be set to OFF for normal operation. Switch 1 must be set to ON when this device is used along with a Jast made memory expansion. H.A.R.P will accelerate the CPU and double its internal clock from 10MHz to 20MHz. However the factory default system bus speed will remain at 10MHz because it is needed for arbitration. That is, it will work in 20MHz when CPU calculates and in 10MHz when accessing external bus. Therefore, the actual speed increase is only about 10%.